Belt Conveyors are made as per the international quality standards and used for various purposes. These conveyors are recognized for their features like east movement and long life service. We manufacture and export belt conveyor to our customers at wide range. These are available at affordable price. 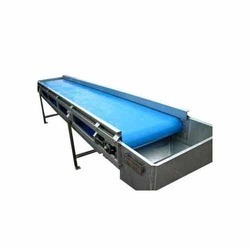 These conveyors are light in weight and can be availed in accordance with client’s requirements. We offer Belt Conveyor are available in various sizes and dimensions which meeting the international quality standards. We fabricate and export specially design belts using optimum quality raw material are highly applauded in the market due to its features like durable, consistent performance even under unsympathetic working conditions. These industrial conveyor belts clients can avail from us these products at reasonable price.